If you are looking for a quick and challenging booty workout, grab a mini band and get ready to feel your glutes BURN in this low-impact mini band booty workout. Thank you so much to Nike for sponsoring this post! Ever since I began regularly attending Burn Boot Camp classes two years ago, I’ve been a big fan of adding challenging “finishers” onto the end of my workouts. At Burn Boot Camp, the last five to 10 minutes of a 45-minute camp are dedicated to a finisher that aims to push your body one last time. It often requires you to dig a little deeper, both mentally and physically. While some finishers are cardio beasts (sprints galore! ), my favorite finishers are the ones that make my muscles feel like they’re on fire. I love a finisher that pushes my muscles to the point of fatigue and I leave the gym feeling like I left it all out there. And that, my friends, is the inspiration behind today’s mini band booty workout! My workout routine is still mostly a mix of gym workouts, at home workouts and BBC workouts but when I’ve been working out at the gym or at home, outside of my BBC workouts, I find myself and adopting their “finisher” philosophy in many of my own strength workouts. I love concluding my workouts with some kind of bodyweight challenge or something a little different and this booty workout was the “finisher” I did at the end of a leg workout two weeks ago. I immediately knew it was worthy of sharing with you guys because my booty was BURNIN’. I completed two rounds of 20 reps of the following exercises and my glutes and hip abductors were seriously talking to me by the time this one was over. Phew! This mini band booty workout lit my glutes on FIRE in the best kind of way and if you’re looking for a serious booty burner, keep this workout in your back pocket! Don’t let the short duration or the fact that this is a low impact workout fool you… it was intense. The only thing you need to complete this workout is a mini band which are found at most gyms and can also easily be purchased for cheap on Amazon. (And this workout can also absolutely be done without a mini band if you don’t have access to one!) Please scroll to the bottom of this post for a detailed list of exercise descriptions for this workout to go along with the above images. 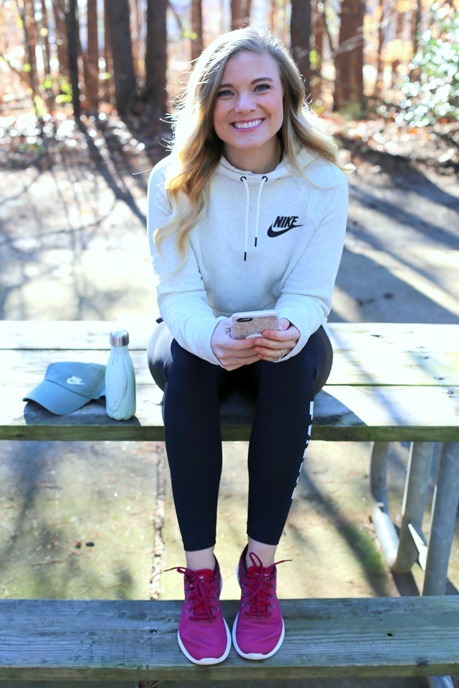 Nike Sportswear Tech Fleece: Back in December I first expressed my love for this zip-up but since I first received it and began wearing it regularly my love for this jacket has quadrupled and grown by leaps and bounds. It’s currently my go-to cold-weather zip up that I wear to and from the gym and around town several times a week. It’s comfortable, flattering and I always, always have someone compliment it whenever I wear it to boot camp. Naturally, after loving my black zip-up so much, I had to get it in another color and scooped up this muted blush pink color that I think is feminine with a sporty flare. I LOVE this jacket so much! 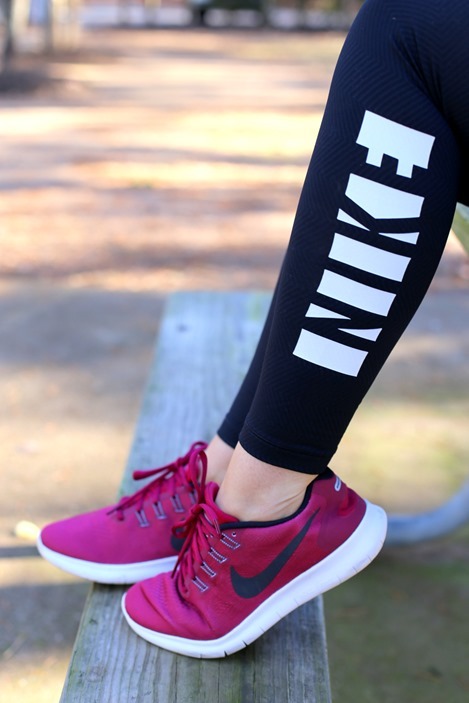 Nike Pro Warm Training Tights: I’ve been a fan of the Nike Pro crops and leggings for ages because they always do a great job of staying in place and feel like a second skin. I often forget I’m wearing them during a workout since I never have to tug at them or move them into place, so I was excited to see a “warm” version of the training tights I’ve loved in the past available. They’re slightly thicker than traditional Nike Pro leggings but still have a sweat-wicking fabric and the movability I love and expect from Nike Pro apparel. Nike Free RN Sneakers: Yep, still over here 100 percent obsessed with my Nike Frees (and my Nike Flyknits)! If you follow me on Instagram you’ve probably seen these shoes pop up in my post-workout pics on my Instagram Stories shares because they’re definitely a workout staple for me. They’re supportive but still lightweight enough to feel comfortable during circuit and boot camp-style workouts that require flexibility. Nike Fleece Hoodie: Somewhere from college to present-day my collection of a million casual hoodies dwindled dramatically. I have two thin pullover hoodies I love for fall and spring weather, but up until about two weeks ago, I had exactly one comfy wintery hoodie. Since I was in the market for an athletic hoodie but still wanted something that looked a little more put-together than an oversize college hoodie, I snatched up the Nike Women’s Fleece Hoodie in a heathered oatmeal color. I typically pair my hoodie with leggings and sneakers or my Chuck Taylors and am also eyeing the same hoodie in the deep gray and rose pink colors. Bridge with Press Out: Begin on the floor with your feet flat and knees bent and your mini band wrapped around your thighs slightly above your knees. Press your hips upwards, raising your glutes off the ground. When you reach the top of the movement, press your knees outward, pause and then bring them back in and lower your hips to the ground. Donkey Kicks: Begin on the floor on all fours with your hands directly under your shoulders, your mini band around both thighs slightly above your knees and your knees under your hips. Keep your right knee at a 90-degree angle and raise your leg so it is as close to parallel to the floor as possible. Squeeze your glutes at the top and carefully lower your right leg toward the ground. Complete designated amount of reps/time before switching legs. Clam Shell: Begin lying on the floor on one side of your body, balancing on the forearm closest to the ground, with your hips stacked, legs bent at the knees, your mini band around both thighs slightly above your knees and your feet positioned behind your body. Pressing your feet together, hinge at the hip to raise the knee of your top leg, opening up your legs like a clamshell. Slowly lower and repeat. Complete designated amount of reps/time before switching sides. Standing Kick Backs: Begin in a standing position with your mini band positioned slightly above your ankles. Place your hands on your hips and slightly bend one leg while you slowly lift the other leg off the ground, taking care to keep it straight as you press back, driving your heel behind you. Squeeze your glutes as you lift and engage your core. Pause briefly at the top and then lower. Complete designated amount of reps/time before switching legs. Lateral Leg Lifts: Begin lying on the floor on one side of your body, balancing on the forearm closest to the ground, with your hips and feet stacked, your mini band slightly above your knees and legs out straight. Flex your top foot and, without leaning forward or backward, engage your core and lift your top leg upwards, keeping your feet parallel. Pause briefly at the top and then lower your leg back down. Complete designated amount of reps/time before switching legs. Do you do anything special at the end of your workouts to challenge yourself a little bit more? What’s your favorite way to end a workout? In addition to the extra challenge of a “finisher” at the end of a workout, I love to take myself through a solid 10 minutes of deep stretching and foam rolling after a workout. I just wish time allowed for that every time! This workout looks amazing! I can’t wait to try it out Julie! I love Nike workout clothes – I totally agree with you that their pants/leggings are some of the only ones I have found that actually don’t move around during my workouts. I love the format of this workout! Do you have a mini band you’d recommend? I have a pair of flyknits and I’m completely obsessed with them…I’m thinking it might be time to order another! My sweatshirt is a small. I think it’s true to size! I’m 5’8” and usually a small up top and a size 6 on the bottoms if that helps! Totally trying this!! I love going on a run and ending the workout with a full on sprint. Also loving that jacket and hoodie!! Hey Julie! This looks like a great workout and I love that you can complete it almost anywhere! Do you have a link to the bands you like to use? I’ve been wanting to get some to add to my strength training workouts and wasn’t sure if there’s some that are better than others. I love the clothes too, it’s funny how a new outfit can add that extra motivation we need to get out the door some days! Thank you! OH I just did a workout this morning with the lads, definitely makes them a bit more challenging! And I love the idea of adding a finisher to the end of workouts. Loving the outfits too! Perfect timing! This workout is deceptively challenging. Really hope you like it! I love that tech fleece, how cute!! Oh sweet! I cannot wait to try this at home workout! Where do you get your resistance bands/do you recommend any? I’m definitely trying to expand our at home gym a little bit at a time! Thanks! Clam shells with bands burn so good! Definitely one of my fav exercises to do with resistance bands. I love to finish with some type of plank work before stretching. I love that jacket you have! I just wish it wasn’t so pricey! I snagged some flyknits from the Nike Sale a few weeks ago after seeing you love them for so long. They are pretty great! I also love the Nike flex RN shoes. I just got some bands I am starting to play with, thanks for the workout. I love those shoes so much! What a fun color. I’m so excited to try this!! I just so happened to buy resistance bands prior to seeing this post!